Preheat oven to 375°F. Mix graham cracker crumbs, sugar, and melted butter in a small bowl until combined. Press onto the bottom and sides of a greased 9-inch pie pan. Bake for 8-9 minutes or until crust is golden brown. Cool on a wire rack. While crust is cooling, prepare the pie filling. Thaw the limeade concentrate until runny. Mix the sweetened condensed milk with the limeade until combined. Add green food coloring to desired color. Fold in whipped cream gently until combined. Pour into the cooled pie crust. Chill the pie in the refrigerator for at least an hour or unitl pie has set up. Garnish with whipped cream and limes. * A store bought graham cracker crust can be substituted to save time. Summertime is here and rather than end dinner with a heavy dessert, a cool refreshing ending is what I (and my swimsuit wearing hips) crave. This Limeade Pie is a light and fluffy pie with a slight tart kick. This pie has been in my husband’s family for years and it always makes it to the table when we are all together. It’s just a matter of time and a flurry of forks before it has disappeared. For this quick and easy pie, limeade concentrate, sweetened condensed milk, and whipped topping are combined and then poured into a sweet graham cracker crust. Then all that’s left to do is let the pie chill in the refrigerator to set up. The only question is --Can you handle the flavor? This pie has a tart flavor that I have grown to love. 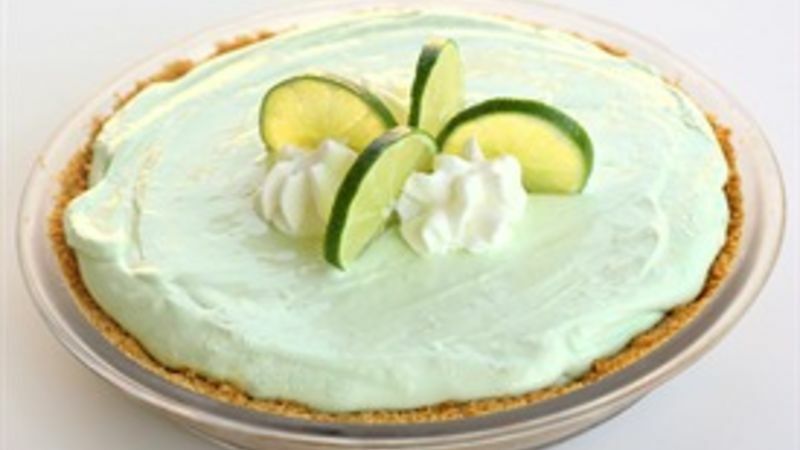 If you love the tartness of a key lime pie, you will love this pie. But be cautious…because the pie is so light, before you know it you’ve eaten half the pie! Time Saving Tip: Don’t have time to make a homemade graham cracker crust? A store bought graham cracker crust can easily replace the homemade crust in this recipe. Try more lime recipes like these!